Matt Buchanan and student nominator Gina Billys ‘18 chat outside the Student Activities Center. Photo courtesy of Honored.org. Matt Buchanan, English teacher and department chair at La Lumiere, has been recognized with a prestigious national teaching award from Honored.org, a nonprofit organization dedicated to “elevating the teaching profession by recognizing teachers across the country who are changing students’ lives.” Click below to read the story, written by Los Angeles Times Column One editor Steve Padilla, of how Mr. Buchanan became the February 2019 Honoree. 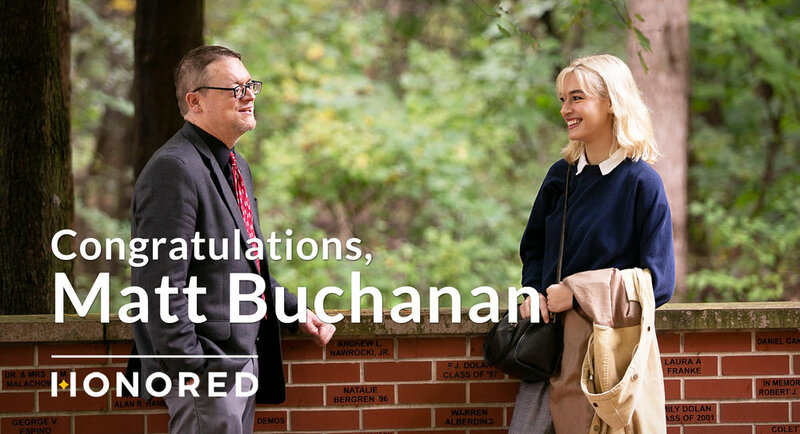 Mr. Buchanan was nominated by 2018 graduate Gina Billys, who was impacted by his kindness during a time when they both struggled to overcome some of life's most difficult challenges. While Gina began falling behind in class due to health issues and stress in her personal life, Mr. Buchanan was recovering from a heart attack. "Mr. Buchanan showed me that everyone is fighting their own battles...but it’s up to you to make the decision to fight those battles or let them consume your life,” Gina said. Now, she is a freshman at Indiana University Bloomington and focuses on fighting her battles optimistically even when the going gets tough. She credits Mr. Buchanan with "sparking that flame within [her]". Mr. Buchanan continues to inspire in his English classes, on the baseball field, in the dorm, at Academic Decathlon, and as a colleague. He currently teaches Introduction to Literature and Composition and a writing seminar titled The Art of Rhetoric, and is also known on campus for being the creator of Poem in Your Pocket Day and for his skills as an accordionist. Andrew Hoyt, Assistant Head of School and Academic Dean, says of Mr. Buchanan: "The students feel known, and they feel seen by him. He shows them he really respects them and truly believes they're capable of great things." It’s no surprise that he has been honored by an organization that believes that “the special one-to-one relationship between a teacher and a student is the foundation of great education,” since that same principle is a core value of La Lumiere, where Mr. Buchanan has been teaching for 10 years. Honored is a nonprofit organization that accepts nominations from current students for teachers who have impacted them personally or academically in an inspirational way. Nominations are accepted from all across the United States, but only one teacher is publicly recognized each month. Profiles of these teachers, authored by world-class writers, shine a light on the outstanding work they’re doing in and out of the classroom. Mr. Buchanan was profiled by Steve Padilla, a 30-year veteran of the L.A. Times, who was also inspired by an English teacher. “Working on this profile of Matt Buchanan reminded me that being a great teacher means having compassion, along with passion and dedication,” Padilla said.